Mommy Delicious: All Hail King Julien on Netflix... And One-Year Subscription to Netflix Giveaway! 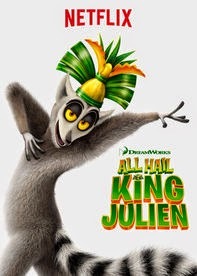 All Hail King Julien on Netflix... And One-Year Subscription to Netflix Giveaway! Remember Madagascar?! Ever since Aiden was old enough to sing, "I like to move it, move it," it's been a favorite of his. And now, we get to spend some of the holiday break tuning in to King Julien as he takes on the jungle's craziest adventures in the new comedy series, All Hail King Julien (which dropped it's first five episodes on Netflix a couple weeks back). King Julien's got his loyal sidekicks Maurice and Mort, and a whole new cast of colorful animals (including the head of security, Clover, and the villainous Foosa). And now, no one can stop King Julien from ruling with an iron fist -- in the air -- "waving like he just don't care." Not only can we spend some time tuning in to All Hail King Julien this holiday break, but we can also check out a couple other shows with King Julien's friends from Madagascar, like Madly Madagascar or Madagascar Penguins in a Christmas Caper. Aiden and I will be heading out of town in a couple of days to do touristy things in another city because we love new experiences. 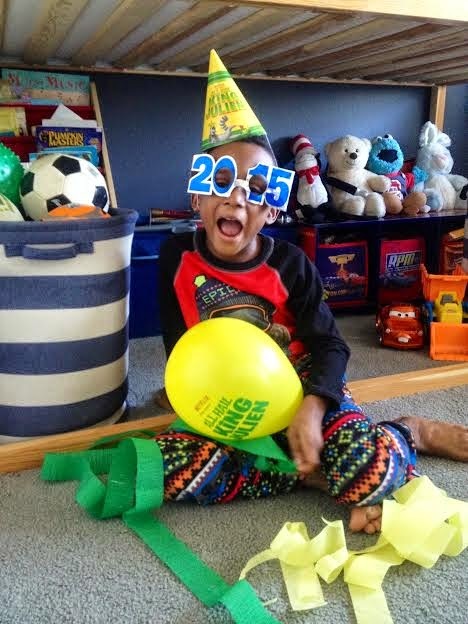 And thanks to the lovely folks at Netflix, we'll be ringing in the new year with style and grace, streamers and balloons, and party hats and "2015" shades! And to top it all off we'll be giving away a one-year subscription to Netflix streaming! Woot! One (1) lucky Mommy Delicious reader will be winning a one-year subscription to Netflix streaming. Want to win?! Enter below! I do not have NF, buy would love to have a selection of movies to watch. I don't have Netflix but would love to watch reruns of TV series I haven't seen in awhile like Gilmore Girls! I love watching 30 Rock and LOST on Netflix. I have a new favorite series - Call the Midwife. I like One Tree Hill and Hart of Dixie. I like to watch breaking bad. I like crime dramas like Law and Order and Bones. I like to watch documentaries on Netflix. I have never watched Netflix before but would love to watch Orange is the New Black. i love to watch horror flicks. Right now I'm loving United States of Tara. I can't wait to watch Friends! I like orange is the new black. I love watching old movies like Roman Holiday. i like to watch scandal! I like to watch the Vampire DIaries. You gotta love 'Orange is the New Black'; it's so funny yet weirdly deep. We don't have Netflix right now, but I would love to have it. Thanks! I am not sure yet-I do not belong and would love to! I just bingedwatch Grey's Anatomy. I love watching new series! I also love watching Vampire Diaries and Revenge! I don't have netflix right now but want to check out Game of Thrones. Breaking Bad and The Walking Dead! We really loved watching Dexter and the Walking Dead!! I love watching that 70's show and old episodes of everybody loves Raymond on Netflix.